Saudi Arabia has officially approved yoga as a sports activity. Until recently, Yoga was not officially permitted in Saudi Arabia as it was perceived to be a Hindu spiritual practice. Just a year ago, yoga practitioners in the kingdom could have been hit with criminal charges. Nouf Marwaai, head of the Arab Yoga Foundation, is leading the effort dispel the notion that yoga is incompatible with Islam. The foundation has trained hundreds of yoga instructors in the kingdom. “Five years ago, this (teaching yoga) would have been impossible,” Marwaai said, according to a Sept. 30 report by AFP. Marwaai’s students say they often confront accusations of betraying their religion. Yoga also has had a transformative effect on many women who have long been denied the right to exercise publicly, the report said. Ayat Samman, a 32-year-old health educator, said yoga helped alleviate her lifelong struggle with fibromyalgia, a chronic pain disorder that often left her bedridden. 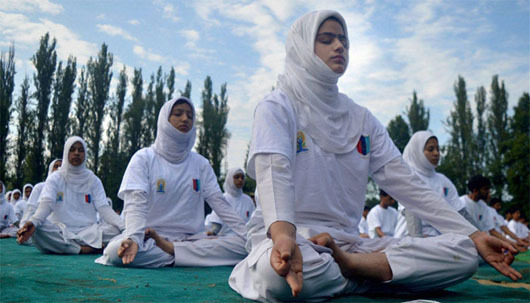 Yoga also has helped women with a common ailment in Saudi Arabia – depression, the report said. Crown Prince Mohammed appears to be upending the puritanical vision long associated with a fundamentalist strain of Wahhabi Islam. The kingdom in recent months has hosted officials linked to the Vatican and the prince also met a group of Roman Catholic and Jewish leaders in New York earlier this year, in a rare inter-faith gesture. “The prince’s outreach to other religions is apparent in the interfaith gatherings and the new enthusiasm for Saudi Arabia’s pre-Islamic heritage,” said Kristin Diwan, of the Arab Gulf States Institute in Washington. This entry was posted in LATEST NEWS, LATEST NEWS - News, MIDDLE EAST, MIDDLE EAST - News. Bookmark the permalink.